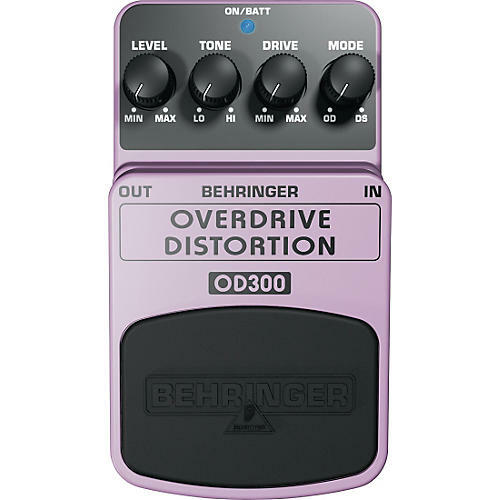 The Behringer Overdrive/Distortion OD300 effects pedal has all your bases covered, from edgy modern-crunch to classic sound of hot and bothered tubes. With its dedicated Overdrive/Distortion blend dial, you can turn all the way to the left for pure overdrive, or all the way to the right for straight-ahead distortion. In between, you get an infinite amount of options for creating the perfect overdrive/distortion cocktail. And with the dedicated Tone, Level and Drive dials, everything you need to create a signature sound is at your fingertips. The LED tells you when this pedal is working its magic, and the top-quality on/off switch maintains excellent signal integrity in bypass mode. You can power the OD300 with either a 9-volt battery, or the optional PSU-SB DC power supply (not included).